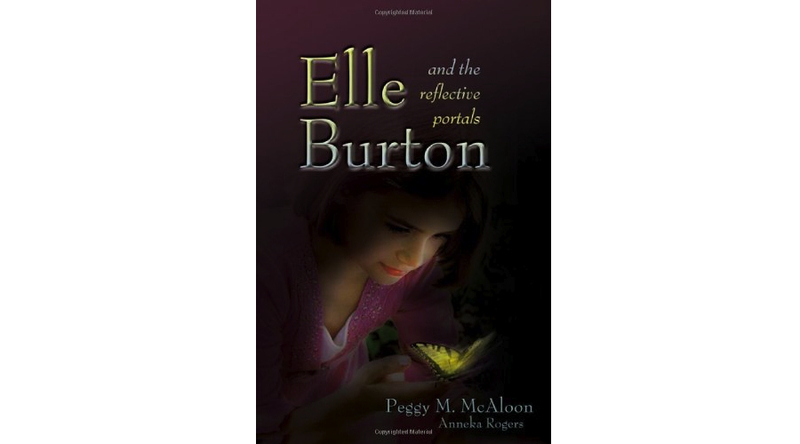 Editor’s note: The following excerpt is from the young-adult novel Elle Burton and the Reflective Portals, by Peggy McAloon, published by Wheatmark. Elle Burton stopped at Lake Menomin on her way to school. It was her birthday. A sudden splash shattered her reflection in the water. Her hands flew out to protect her face from whatever exploded upward and she felt . . . something. A butterfly’s wings? She cupped her hands together, lacing her fingers tightly. Elle’s dark eyes widened in amazement, but she didn’t loosen her grip. “What are you talking about?” Elle whispered, afraid she might break the spell. “I can’t talk to you . . . it’s against the rules.” The creature was now trembling in her hands. Elle unlatched her fingers a little. She stared down in amazement at the tiny figure huddled in her hands. It looked like a butterfly but it was standing on two legs. Yellow wings with black markings were wrapped neatly around a petite human-like being with curly red hair. The creature’s huge emerald-green eyes stared defiantly at her. She explained that her name was Eunie Mae and how Fiorins protect the children of Earth from the time they are born until their eighth birthday. Since Elle was now ten, Eunie Mae thought she must be one of Earth’s chosen human guides to the Fiorins. To test the theory, Eunie Mae instructed Elle to wish herself to the hospital. Elle and the creature arrived at the emergency entrance to the hospital at the exact moment Elle’s pregnant mother is lifted out of an ambulance. Ginny Burton delivered a healthy baby boy while Elle waited in the family lounge with a hospital volunteer. After the baby’s birth, Elle curled up in a chair next to her mother’s bed and they both fell asleep. “Elle, honey, wake up.” Warm breath from the low whisper tickled her ear. Her eyes flew open. Before she could yell out, her father put his finger up to his lips. “Poppy! You came home. You get to see Mom and the new baby,” she whispered. Elle stared at him as tears began to fill her eyes. “No one made it.” Her father reached out to pull her into his arms. “No!” Elle gasped. She jerked free and ran down the hall toward the nursery. She stopped at the viewing window. “Why are you telling me these horrible stories? You’ve never lied to me before.” Elle choked on the words. He reached for her again. This time she did not move away. He embraced her for several minutes. “Elle, you are going to have experiences others only dream of. Youwill visit Fiori, where the flowers are as big as tractor tires. You will sail on the back of a giant turquoise bird and catch an elevator made of a spider’s web. You will ride on the back of Pegasus and be protected by a powerful warrior named Amadeus. Major Burton knelt down and put his hands on Elle’s shoulders. “Never forget how much I love you all. Tell JJ about me.” He disappeared. Elle buried her face in her hands and sobbed as she sank to her knees. “I know, but it wasn’t meant to be.” Eunie Mae flew over and settled on Elle’s shoulder; her fluttering wings skimmed Elle’s cheek. Elle smiled as she watched her brother on the other side of the window. Fiorins flew from one baby to the next, bragging about this one’s beauty and that one’s intelligence. Elle could hear the low hum of their chatter even through the window. A young nurse in the cornerof the room continued with her duties, oblivious. “It’s been this way as far back as I can remember.” Eunie Mae suddenly took off and flew along the corridor toward the nursery door. JJ was waking up, and he started to cry. Elle watched as JJ’s Fiorin settled down on the blanket that was wrapped snugly around him. Eunie Mae’s wings fluttered and brushed against JJ’s cheek. JJ settled back to sleep, and Eunie Mae rejoined Elle in the hallway. “That’s crazy!” Elle tried to imagine what it would be like. “Careful . . .” said Eunie Mae. Eunie Mae nodded her approval. “Yeah. Sorry about that.” Elle turned and walked back towardher mother’s room. “Good night,” she whispered to Eunie Mae as she left. Elle had her chance to visit Fiori shortly after her father’s funeral. She was in the nursery at home with her mother watching her feed and dress the new baby. “It’s Saturday; do you have any plans for the day?” her mother asked. Ginny rose to burp the baby. Elle stood up and walked over to the antique white and gilded mirror over the changing table. Her mother’s back was to her. The pink robe Poppy gave her for Christmas two years ago was gently draped across her narrow shoulders, the belt looped around her tiny waist. JJ’s fine hair framed his angelic face as his eyes widened with each pat on the back. From the center of JJ’s reflection a tiny figure flew out of the mirror. He was dressed like a miniature butler. “I . . . I think I’d like to go over to Megan’s for a while. Is that okay?” Elle hoped her voice sounded natural. The little butler reached out to Elle. “Take his hand,” Eunie Mae said from across the room. Elle glanced back at her mother to make sure she wasn’t looking, then extended her hand. She felt like she was dropping through space. The sensation of falling was overpowering. She tried to scream but there was no sound. She closed her eyes, afraid she was going to be sick. As suddenly as it started, she felt her feet touch the ground with the lightness of a feather. Elle slowly opened her eyes, and then blinked as the magnificence of her surroundings overwhelmed her. It was like nothing she had ever seen on earth. The sky was burnished with red, purple, and gold shades of the most spectacular sunset imaginable. There were no clouds in the sky—simply a shocking combination of colors creating a gleaming rainbow that went on forever. Elle slowly turned toward the voice and gave a little gasp. Sparkling ponds glistened everywhere, reflecting the profusion of brilliant colors blanketing Fiori. “It’s like a fairy tale,” Elle said. Her eyes continued to drink in her surroundings. The azalea bush directly in front of Elle exploded outward as a redheaded Fiorin stumbled toward her. She held out her arms to prevent a collision. “I’m very sorry, miss!” He giggled, raised his purple wings, and scattered broken flower petals all over her as he flew away. Elle turned as a dazzling Fiorin flew down from a sunflower. The creature had smoldering violet eyes. Elle felt a sudden sense of déjà vu. “Welcome to Fiori. I can’t believe how good it is to see you.” She opened her arms, and Elle moved rapidly into the embrace. It felt so safe and wonderful—as though an unfinished story suddenly reached its happy ending. Graybar nodded and rose on his immense wings, to follow the petal-covered path on the right. “I can’t tell you how delighted I am you have been chosen, Elle. They walked along the path to the left. Elle heard sounds of merriment a short distance ahead. They rounded a lilac bush full of lavender blossoms. Elle paused at the astonishing sight in front of her. From the petals of an extremely large sunflower hung long strands of what looked like spider webbing forming a May Day swing of sorts. A Fiorin was perched on each seat. The sunflower spun around as the Fiorins swung far out from the center of the flower. Wings flapped and feet swung in rhythm to the songs of the huge turquoise birds floating in the adjacent pond. At the next turn of the path, Nextra moved over to the side and stopped next to another spider web. Taking Elle’s hand, she directed her to place her feet in the center of the web. The web started to lift slowly into the top of a magnolia tree. Nextra hovered next to her as she held her breath and continued her upward path. The blue and white wings flapped gracefully as the two moved slowlyup toward the top of the tree in complete unison. Almost as soon as it began, the movement of the web stopped at a step made of a clamshell. Elle looked up into the face of a giant spider and gasped. Elle eyed the creature warily as she slipped off the web and onto the smooth step. In front of her rose a structure similar to the grass huts she’d seen in pictures of Hawaii. Nextra lifted the corner of the silky fabric draped over the entrance. Elle moved into the bright room Nextra called home. Nextra walked over to a wooden trunk and lifted the lid. She carefully removed a steaming teapot and two cups and saucers and placed them on the table. Elle watched her every movement. Nextra returned to the trunk and lifted out two napkins and a plate filled with tiny yellow cakes adorned with white- and brown sugar frosting. She placed these on the table and motioned to two chairs. “Come and join me,” Nextra said. Elle looked at the trunk as she moved to a chair to sit down. “I remember you like hot chocolate.” Nextra smiled and filled a cup for Elle. Elle blinked at the cakes and hot chocolate. Her head spun as she tried to comprehend Nextra’s words. She jumped out of the chair and hurried over to the weathered, brown trunk. She lifted the lid swiftly. Elle gently replaced the lid on the trunk, retraced her steps, and sat gingerly on the chair by her hot chocolate. When they were finished, Nextra cleared the table and placed the dishes in the trunk. Elle noticed that she didn’t wash any of the dishes. Nextra smiled, moved her wings, and floated through the door. Elle counted to herself in her head. By the time she reached twenty, she couldn’t stand it anymore. She walked over to the trunk. Being careful to not make a sound, she slowly lifted the top. The trunk was completely empty. Peggy M. McAloon is a retired speaker, trainer, and national sales manager in the field of commercial credit. This is her first novel. 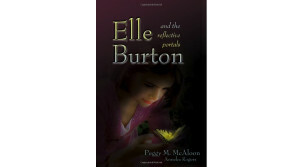 She is now working on the second book in the Elle Burton, “Lessons from Fiori” Series, Missing. As an author, Peggy has been featured on numerous interviews (see http://peggymcaloon.com/books for links) in her efforts to empower kids in trouble to seek help and inspire others to help through fantasy. When she’s not writing, you can find her at the School of the Arts in Menomonie, WI or by Tainter Lake in Dunn County, WI creating watercolor paintings, reading, and playing with her grandchildren and two Shih Tzu rescue pups. Previous postThe New, Improved Fictional Café Has Arrived!